We are excited to launch Livingrm beta, the personal network for close friends. Social network is a great social utility for sharing and connecting with friends or family. However, as social networks are becoming more and more open than ever, they become less and less useful for sharing and interacting with close friends. Open social network is like a pub gathering or a rave party that you know it is quite public, whereas Livingrm is like your living room where you can be youself and enjoy it with your selected friends. Here in Livingrm the privacy just works. It is simple and advanced. You do not need to tweak pages and pages of privacy settings in order to make it work for you. 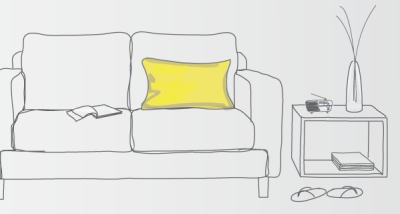 Livingrm is designed for sharing and interacting with close friends and family. It separates friends and family into two exclusive networks, and it helps you manage your friend relationships,. Livingrm is designed to help users manage friend relationships better. One innovative feature we've built is the 'Friendar'. Friendar calculates an in-score between you and each of your friends based on your interactions with them. Friendar let you visual your friend relationships according to in-scores. The higher the in-score, the closer a friend will appear in the Friendar screen. You can see how much you interact with one friend comparing to another friend; you may decide to move a friend closer by finding ways to improve your in-score with he or she. We commonly interact with friends in small social groups. Social groups can be as small as 2 or 3 friends. 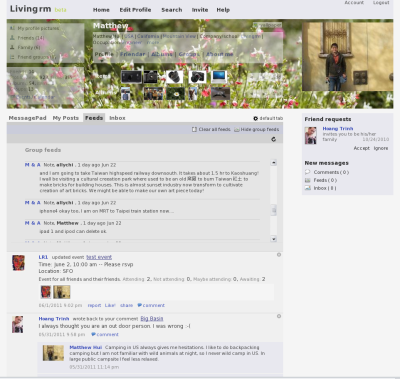 In Livingrm users can create private groups to mimic their social circles easily. Friends within groups can talk, share posts, create group albums, and create events without regarding people outside the group. It's like having mini private/public networks within your Livingrm. Photos capure our lives and memories and we share photos the most with friends and family. Why not archive your pictures while your share? Livingrm allows user to upload full size pictures to albums. You friends and family will be able to enjoy bigger and more detailed pictures. You will also have a peace of mind that your photos are safely archived in Livingrm. In Livingrm it's all about users' needs. It could be the personal network that you have been looking for. It's simple, powerful, innovative, and social. Expect more great features in the future from us. We hope you enjoy using Livingrm!